Schools, libraries and community centres fulfill vital roles in our community, acting as hubs where people gather, access services and programming as well as being as an anchor for neighbourhoods. Unfortunately, our city is facing a challenge in that these facilities are beginning to disappear. On the surface, there are two overriding challenges that need to be addressed. First is, who own/runs that hubs; the answer comes back with four distinct groups: the City of Windsor, the Greater Essex County District School Board and the Windsor-Essex County Catholic School Board and community groups. Although all have a mandate to serve the community, they do so in different ways with the school boards’ primary purpose being educating our youth; the City oversees a variety of community tools that are largely driven by a tug of war between bureaucratic inertia and political will power; as for community organizations, their mandates are as wide ranging as the groups themselves. As a result, the idea of the buildings and facilities that they operate acting as community anchor are often overlooked in the face of the day to day services they provide and costs. Please note that this overview engages with the first three groups (the City and School Boards). This brings us to the second issue, do these amenities drive people or do people drive amenities? There have been a rash of consolidations of city services in recent years, with Water-World fate still ambiguous, the closure of Oakwood Community Centre, on going debates about ice at Addie Knox and this coming week (May 4th) council will consider the amalgamation of 3 city library site in 1 new facility on or around Walker Road. The school boards are not much better, as enrollment has continued to decline (particularly in the Catholic Board)school closures have increasingly become a necessary step for the cash strapped boards. The City of Windsor has seen a decline in population over the last census people and the challenges to the city core are still acute, yet facilities in the downtown are on the chopping block while ones on the fringes of the city see expansions. Purple – Three Public Libraries that are up for consolidation. Brown – Water World Community Centre (slated for closure in June) and the Oakwood Community Centre that will be closed and merged with the South Windsor Rec. Centre. Grey – are four Public Schools have been labeled “Priority Schools” by the board making them more open to the community. 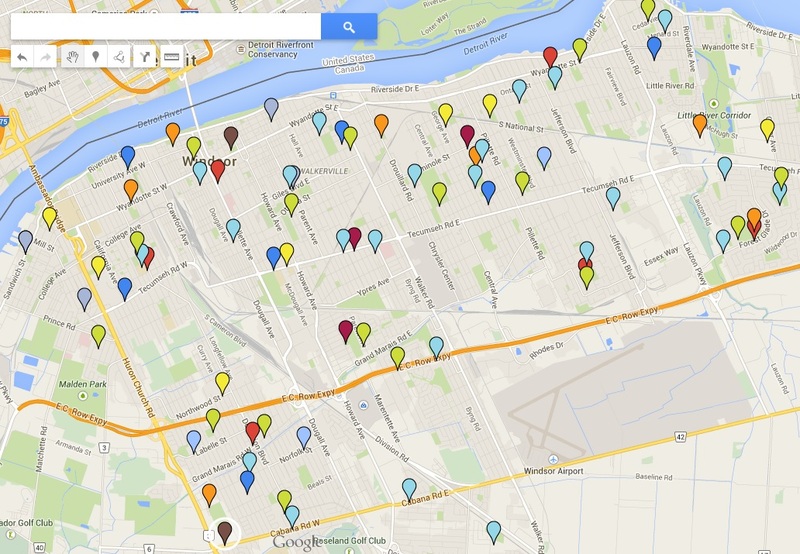 What are not shown on this map are private schools, seasonal or outdoor facilities owned by the city and community organizations that may have space or act as a hub. What I take away is the following. First, is of course how few “community facilities” the city operates compared to the school boards. To be fair, direct comparisons of costs and usage of a library or a community centre to a school is unfair but the map is clear, the schools boards have a much larger footprint in our community. Second, public libraries and schools seem to go hand in hand. From the mapping you find that almost all of the libraries have a school within a few blocks if not in immediate proximity to it. My impression would be that the libraries offer after school and rec programs for the children that attend the nearby schools. It could also be possible that by placing these facilities so close to one another we are doubling up on capacity in certain areas and leaving other areas under served. Third, the strip that runs south of Tecumseh Road seem to be largely devoid of schools, libraries or community centres. Barring an error in my mapping, this no mans land of sorts is a major concern as accessibility to facilities and programs could be an issue for residents living in those areas. As the population has moved from the city core to the fringes or near suburbs of Tecumseh and LaSalle; amenities have followed them. To a degree the mapping shows this with an inner ring of facilities north of Tecumseh and a second band running nearer to EC Row before curving up near Louzon Parkway. The financial justification for moving facilities away from certain neighbourhoods in the core towards the outer rim of the city is certainly there. The bigger question is, is this what we want for our city? There is a bit of a chicken and the egg predicament here. If there aren’t the people to justify the facilities, they need to be operated at less than maximum capacity, thus at a loss financially. Yet the loss of a school, library or community centre can be a devastating blow for the community (this is a link to a PhD Thesis from UWO on the subject of school closures is interesting) resulting in further loss of people or the inability to attract new transplants to that neighbourhood. Those who remain, find themselves worse off, as data from the US has shown that the loss of schools from an neighbourhood adversely impacts property values. It would not be surprising to find the loss of a community centre or library having similar but smaller impacts as well. What is needed is a new approach, various members of our city council have stated that they want to make our city more dense, walkable and liveable. Ensuring that neighbourhoods have access to community anchors like schools, libraries and community centres is vitally important if our community is going to grow moving forward. If we continue to move, merge and expanding on centralized amenities without considering the broader consequences, we threaten the fabric of what holds the city together. By moving these facilities away we are just depressing the segments of the city that are already weak and reducing the access to programs by those who may need them most. The path forward may be finding synergies between existing community hubs with other organizations and groups. Why can’t a community library share space with a school that is under capacity to make it viable? Why not find new partners (the health unit, provincial offices, tutoring programs) to buy in on existing facilities to make them more viable financially and provide community services. Why is it when a school is closed, a neighbourhood is more or less abandoned, why can’t other organizations be subsidized to move into those facilities? What is needed is out of the box thinking and hopefully someone comes up with something before proposals blindly move forward. This is particularly relevant in neighbourhoods that had lots of children in the seventies and eighties. Now that the kids have grown up and moved away, and the parents have become senior citizens, we see emptying schools. Renting out some of the excess capacity for services for seniors can be a win-win for everyone. Of course it’s easier said than done, but I see this as an important step in keeping our neighbourhoods vibrant. Agreed, a number of schools have recently closed as the surrounding neighbourhoods have lost most, if not all of the children through demographic shifts. The major discussion is whether there is a viable model for small and more numerous community hubs through the city rather than the current trend of consolidation of facilities into a handful of locations. Thanks for commenting and please share.